Highly effective for cleaning fruits and vegetables. Fruits and vegetables are sprayed with toxic chemicals to protect them from pest and fungal attacks. They are coated with a wax or oil to prevent decay and to preserve the quality and appearance of the produce during transportation. This waxy layer is also host for micro-organisms like bacteria, fungi and viruses. The Veggie and Fruit Scrub Cloth is designed for cleaning fruits and vegetables – there is a rough side for scrubbing and smooth side for polishing. It is highly effective for removing dirt and debris from all your fruit and vegetables. 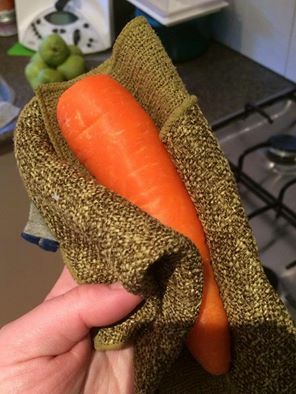 Wipe down all produce even if you will be peeling it. By doing so you prevent contaminating the flesh of the produce as you remove the skin. HOW TO USE: Wet produce to be cleaned. Use rough side for scrubbing dirt or wax from surface and soft side to polish, or for fruit and veggies with more delicate skin. MAINTENANCE: Rinse with warm water after use and hang to dry. You can buy the Norwex Veggie and Fruit Scrub Cloth online from me, in Australia. Or you can buy it in New Zealand here. If you are elsewhere, check Norwex.com to find a consultant in your country.